A couple of years ago, we saw Rhett & Link put a telephone conversation through YouTube’s caption generator, and the video was hilarious. Now, YouTube’s Collective Cadenza, or “cdza,” has run the “Fresh Prince of Bel Air” theme song through Google translate several times through several languages, and the results that they received back became this entertaining video, where the song is sung with new lyrics. One day, captioning and voice recognition won’t be so comical. But today, it is, and it brings us some fine entertainment. Once again, translating technology gives us a good, hearty laugh. People in the future must be rolling on the floor at our primitive computer translating. But hey, what do you expect when so many languages have so many different rules? Right now, that requires a human to correct the intent and meaning. And thus, laughs ensue when the computer fails to recognize these differences. The channel is fairly new, with 16 videos, so it becomes a sort of “one to watch” in the upcoming year. If they continue to have fun with music like this, they’ll be a surefire brand name on YouTube. This entry was posted in Armonk, Bedford, blog and tagged Armonk Homes for Sale, Armonk Luxury Real Estate, Armonk NY, Armonk NY Homes, Armonk NY Homes for Sale, Armonk Real Estate, Horse Farms for Sale on January 17, 2013 by Robert Paul. The good news is yes, you can receive a gift from your parents to buy a house, but the way that you actually receive the gift is very important. Mom and dad can’t just leave money under your pillow like the Tooth Fairy did when you were younger. The process of accepting a gift for your down payment isn’t complicated, and by following these simple rules, you can be sure that the underwriter who is reviewing your file will look at it with an approving eye. The relationship between the home buyer and the person giving the gift. The address of the home being purchased. Next, you’ll need to create a paper trail. This is important because underwriters will look for where the money came from and where it went. In simple terms, they will look for proof that the money came from your parents’ account and went into yours. Each situation will be slightly different, but be ready to provide paper proof of your parents’ account having money in it, money coming out of that account, a deposit into your account and proof that your account now has the money in it. Accuracy matters when creating this paper trail, so make sure each transaction is for the exact amount of the gift. Creating a paper trail correctly has proven to have its fair share of hassles. Getting copies of transactions is time-consuming, and underwriters seem to question every little thing in the process (“where exactly did the $10,000 transfer that I see coming into mom and dad’s account come from?”). The good news is that there’s a shortcut when it comes to gift letters — one that makes the entire process easier. If you add this line to your gift letter, you can avoid all of the paper chasing that most underwriters will require. A day or two before closing, you can get wiring instructions from your escrow agent for mom and dad to wire the exact amount of the gift directly to the escrow company working on your transaction. This entry was posted in Armonk, blog, Chappaqua and tagged Chappaqua Homes for Sale, Chappaqua NY, Chappaqua NY Homes, Chappaqua Real Estate, Chappaqua Real Estate for Sale, Chappaqua Realtor on January 17, 2013 by Robert Paul. This entry was posted in Armonk, Bedford, blog and tagged Armonk NY, Armonk NY Homes, Armonk NY Homes for Sale, Armonk NY Real Estate, Armonk NY Realtor on January 17, 2013 by Robert Paul. Alex Rodriguez listed his custom home in August but has pulled it off the market. Alex Rodriguez was scheduled to undergo hip surgery in New York today, but Miami is where the perennial MLB All-Star is expected to spend the bulk of his six-month recovery process. He has the perfect house just for that purpose, now that the Yankees third baseman has pulled his waterfront modern off the market. Rodriguez listed the 9-bedroom, 13-bathroom custom-built beauty for $38 million in August, but Gossip Extra reports that the slugger has decided now is not the time to sell. Instead, A-Rod will make use of the pool, state-of-the-art gym and batting cage to rehabilitate his surgically-repaired left hip. The goal is to get back into the Yankees lineup after the All-Star break in mid-July. By then, A-Rod will be turning 38, and he’ll be eager to prove to critics that his Hall of Fame-caliber baseball career is not over, especially after his horrific postseason performance that helped knock the Yankees out of the playoffs. The indoor batting cage at A-Rod’s Miami estate. This entry was posted in Armonk, Bedford Corners NY and tagged Bedford Corners Homes, Bedford Corners NY, Bedford Corners Real Estate, Bedford Corners Real Estate for Sale on January 17, 2013 by Robert Paul. This entry was posted in blog, Pound Ridge, South Salem and tagged pound ridge homes, Pound Ridge NY Homes, Pound Ridge NY Real Estate on January 17, 2013 by Robert Paul. This entry was posted in Armonk, Bedford, blog and tagged Bedford NY, Bedford NY Homes, Bedford NY Luxury Homes, Bedford NY Realtor on January 17, 2013 by Robert Paul. This entry was posted in Bedford Corners NY, Bedford Hills, blog and tagged Bedford Hills Homes for Sale, Bedford Hills NY, Bedford Hills NY Homes, Bedford Hills NY Real Estate on January 17, 2013 by Robert Paul. This entry was posted in South Salem, Waccabuc NY, Westchester NY and tagged Waccabuc Homes for Sale, waccabuc luxury homes, Waccabuc NY, Waccabuc NY Homes, Waccabuc NY Real Estate, Waccabuc Realtor on January 17, 2013 by Robert Paul. This entry was posted in blog on January 17, 2013 by Robert Paul. Keeping up with Google’s ever-changing algorithm updates on WordPress blogs requires constant monitoring and adjustments, which many webmasters fail to keep up with. Following the Penguin algorithm update, millions of bloggers experienced a halt or decrease in traffic. Although keeping up with industry trends does require frequent updates to continue performing well in search, most tasks are not time consuming at all. This guide will help you understand recent changes to Google’s algorithm and how to update your WordPress blog to follow the new industry standards. The Penguin and Panda algorithm updates targeted low-quality websites full of duplicate content, spammy linking, and poor user experience. WordPress is a wonderful content management system and blogging platform out-of-the-box, but it does create massive amounts of duplicate content. The days of large scale link exchanges and linking to unrelated, low-quality websites were abruptly ended by the Panda update. In previous years, many bloggers would create low-quality sites with poor internal linking structure, few quality pages and banner ads taking up majority of the pages, which was halted by Penguin. Many bloggers, especially personal bloggers, were left wondering what to do and how to monetize their blogs. Sure, the days of quick and easy links are over, but this doesn’t mean there is any less value to link building. In fact, high-quality, relevant links are valued more than ever. Before building new links, it is imperative to go back and fix your current link profile. Start out by pulling a backlink report of your website. Sift through each of the results, identifying any low-quality or irrelevant links. Contact each webmaster to remove the links. 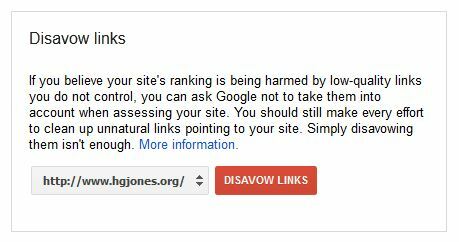 If you cannot find contact information or the webmaster refuses to remove the links, consider using Google’s new disavow links tool. Now that you have removed all low-quality links pointing to your website, take a look at who you are linking to. Many personal bloggers sell text link ads and sponsored posts for extra income. These days are nearing their demise. Your PageRank is not only determined by inbound links, but also outbound links. This will remove any value passed on from your website to the advertiser, and will help your website conform to Google’s webmaster quality guidelines for link schemes. Fear not, your blog can still be monetized. Consider signing up for Google’s display advertising network: AdSense. Offering display advertising options is the safest way to continue monetizing blogs. After all, Google wouldn’t offer it if it would hurt websites. Be careful not to overdo it with the display ads. Websites with 50 percent or more advertisement saturation will be penalized, so placement and ad quality will be key to allowing effective ads that will make you money. Consider looking into conversion optimization and a/b testing to find which ads perform best in different spots on your website, and be sure to filter the types of ads that can be displayed so they are relevant to your audience. YouTube videos can also be monetized, so consider starting a YouTube channel and incorporate video into your blog. Although most link building practices have been blacklisted by Google, there are still many ways to build links to blogs. Instead of exchanging links on lengthy links pages, consider exchanging guest posts with highly relevant blogs. Write high-quality, enticing content that other websites will want to reference with links. Sign up for Google Plus and set up Authorship. Look for websites containing recommended blog lists relevant to yours, and inquire about getting listed. Review products within your industry, and use social media to let those companies know you reviewed their products. They may include your review in their list of testimonials. Attend or exhibit at industry events which list attendees on the event’s website with links. Become a thought leader in your niche by creating and promoting linkable assets like white papers, guides, videos, ebooks, and best practices. Optimizing WordPress blogs requires a few plugins and configurations to meet today’s industry standards. Start off by downloading and installing a plugin called WordPress SEO. 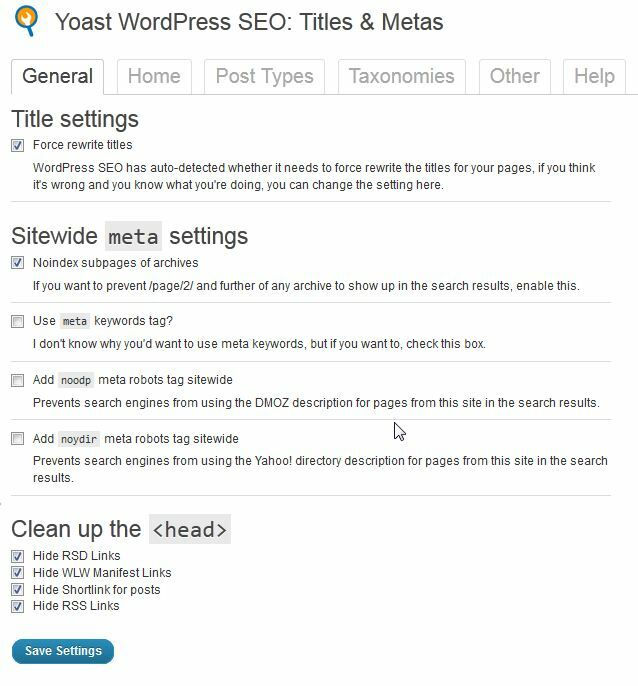 This is the best SEO plugin available for WordPress, and it has an import feature to import any settings from other SEO plugins. Download and activate another plugin called W3 Total Cache. This is the best caching plugin available, and works in unison with WordPress SEO. W3 Total Cache will help decrease page loading speeds by creating a cache of each page. Any time you mark a comment as spam, save a draft of a post, or click off the page editor, WP creates a duplicate copy of those pages. Using the WP-Optimize plugin will purge all those unnecessary copies, which will save server space and speed up your website. WP-PageNavi is another must-have plugin for optimizing your pagination by adding the rel=prev and rel=next attributes. This will help your website be indexed more efficiently and increase crawl depth. Once all those plugins are installed and activated, you will need to configure them. Use the WordPress SEO plugin to set up Google and Bing Webmaster Tools from the “Dashboard” menu on the plugin settings. Next, go to the Titles &Metas menu. On the General tab, check the box to force rewrite of titles if your custom title tags are not showing up. Check the box to Noindex subpages of archives. Check all four boxes to clean up the head by hiding RSD links, WLW manifest links, shortlinks, and RSS links. On the Home tab, write a custom title tag and meta description for your homepage. You will also want to go through all pages and posts on your site and write custom titles and descriptions for each using the post editor. Enter in the URL of your blog’s G+ brand page in the Google Publisher Page field. This will set up the rel=publisher attribute for your homepage and connect your blog to your G+ page. Once all those options are set up, go to the Taxonomies tab. 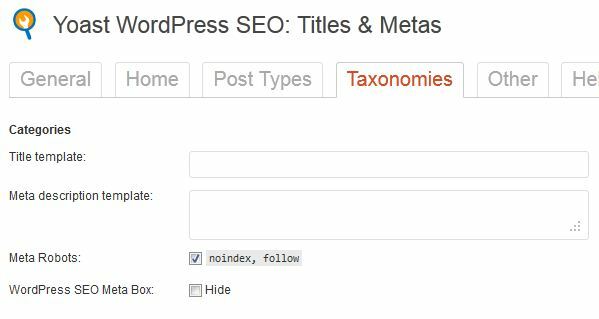 WordPress creates massive amounts of duplicate content through taxonomies. Every time a category, tag, date, or author archive page is indexed, it creates a duplicate copy of each of those posts. Check the box to noindex, follow the categories, tags, and format. Go to the Other tab and noindex, follow the author archives and date archives. Don’t worry about crawl depth from doing this. As long as you have optimized pagination set up through the WP-PageNavi plugin, your website will still be crawled effectively. I recently ran an experiment on noindexing taxonomies in WordPress to test this theory out. 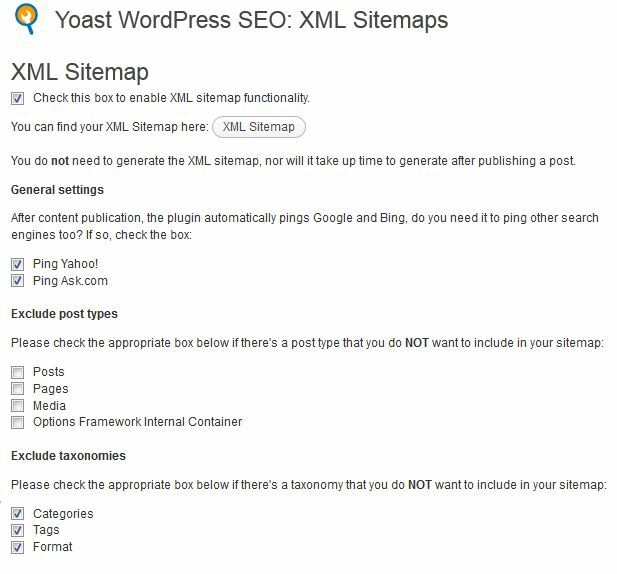 Next, go to the XML Sitemaps menu in the WordPress SEO plugin. Check the box to enable XML sitemap functionality, and submit your sitemaps in Google and Bing Webmaster tools. Check the boxes to ping Yahoo! and Ask.com. Check the box to exclude taxonomies for categories, tags, and format. Now go to the Permalinks menu and check the boxes to strip category bases and remove ?replytocom variables. You will also want to go to the WordPresspermalink settings and strip categories and datestamps out as well. On the Internal Links menu, check to enable breadcrumbs and implement breadcrumbs on your posts. A snippet of code will be provided in the plugin. Setting up Google Plus authorship is very quick and easy on WordPress sites. Download and install a plugin called Google Author Link. Under the settings menu for the Google Author Link plugin, select an author for the homepage of your website. Now go to the Users menu in the WP dashboard and edit each user’s profile. Add in the URL to each author’s G+ profile. Next, ask each author to add a URL to your website on the “Contributor To” section of their G+ profile. Authorship is now set up on your blog. Microdata is still a relatively new concept, first introduced with HTML5. Schema.org is a joint project by Google, Yahoo and Bing to help webmasters mark up their websites so search engines can better understand their content. Bing and Yahoo give a boost in rankings just for setting it up while Google changes the appearance of your listings in search engine result pages to increase clickability. Before setting up microdata, you will need to change the doctype of your website to the HTML5 format. To do this, go to Appearance>Editor. Select the header.php file. At the very top of the header.php file, you will see a doctype. If it is not already in HTML5 format, change the doctype to <pre><code><!DOCTYPE html></code></pre>. After updating the file, check your website to make sure this did not cause any compatibility issues. 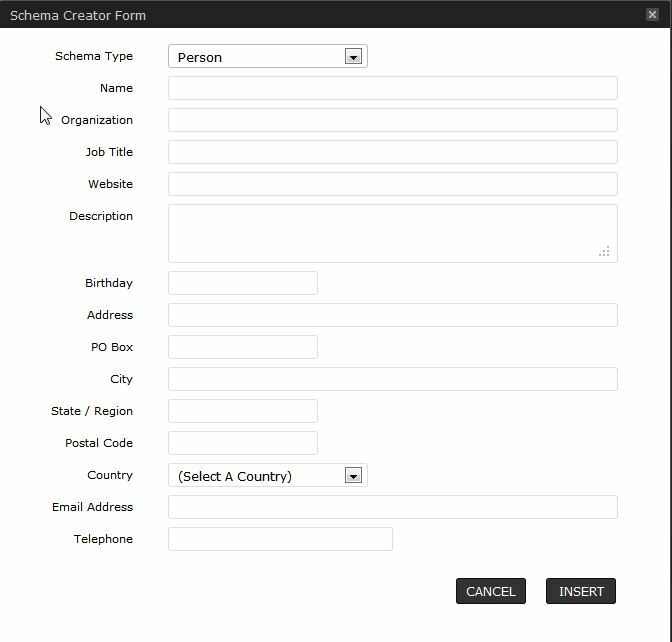 Now that your website is HTML5 compatible, you will need to download and install a plugin called Schema Creator by Raven. Once activated, the plugin will automatically add schema.org microdata throughout your website. Setting up microdata is as simple as that. If you would like to add in more microdata, go to your post editor or page editor, and you will notice a small icon with the letters “SC” in it at the top of the editor. This tool will allow you to add in microdata for people, products, events, organizations, movies, books, and reviews. It will create a short code and place it within the page for you. Always update your version of WordPress and all plugins as soon as updates are available. If you fail to keep up with updating plugins and versions, you may run into compatibility issues later down the road that will break your website. Also, make an effort to publish new content at least once per month. 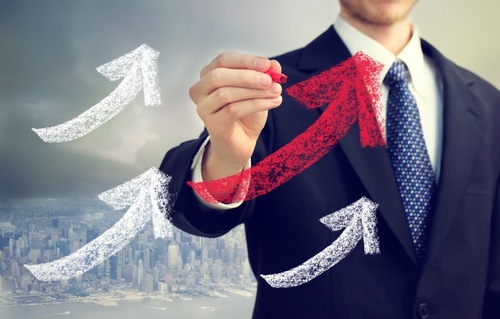 Google loves fresh content, and favors websites that are updated frequently. If you get lazy about posting regularly, your traffic and rankings will suffer. One final piece of advice is to monitor your analytics and webmaster tool accounts at least once per month. This will help you monitor technical issues that may arise as well as traffic drops. If you notice any abnormalities or receive warning messages in webmaster tools, act on these issues in a timely fashion. This entry was posted in Katonah, Lewisboro and tagged Katonah Homes, Katonah Homes for Sale, Katonah Luxury Homes, Katonah NY, Katonah NY Real Estate, Katonah NY Realtor, Katonah Real Estate on January 17, 2013 by Robert Paul.